In the early 80s, I built my first digital clock using exclusively TTL ICs. I had a crystal oscillator driven by 7400 NAND, a cascaded frequency divider using 7493 Binary counters to get the 1Hz clock and 16Hz for time adjust, cascaded counters for the clock itself, and a multiplexed display using 6x7-segment LEDs (VQB71) decoded with 7447. For a 14 year old geek, it was an amazing journey to build it and see that it actually works. Later I changed the LED display indicators to Russian Nixie tubes but had to re-work the whole display part. Ever since, I was always inclined to wear a digital watch and especially liked the ones with unusual display but never liked their build design. In the 80s and even today all digital watches had / have the typical shiny metal Timex look or the rubberized Cassio look but they always felt very plastic, cheap and unattractive, so I found myself reverting to the classic analog watches because of the huge variety of designs. When it comes to modern digital watches for the average Geek, I must mention TokyoFlash. They have some pretty cool and unusual designs. There is another problem I had - one looks at the watch a number of times a day, every day, every month and if you are like me - I'd get tired of the same watch after a month or two and would like to see something else on the display but then it means owning and maintaining a bunch of these watches and who has time and money for that. That's until I discovered the Pebble Steel - IMHO this is the best digital watch hands down. Note that I am not saying it is the best Smart Watch, which probably it is too. But the ability to use thousands of watchfaces is amazing and the simple yet classic stainless steel look is amazing. It has a touch of a "retro" with the rectangular face and the geekiness of the Marvin Malton 160 Flying Hour. It might sound like an oxymoron but it has a stylish look for the geeks. The buttons, which actually stick pretty far out are another very nice touch. The thickness and overall size are just about right for my hand. There are a two types of finishes and two watchband options - I personally prefer the metal band (although the leather band is pretty nice too) and the stainless steel look. I only wished they didn't display the "Pebble" branding so prominently on the face of the watch - it is somewhat distracting. It just needs 2/3 of this font size IMHO. 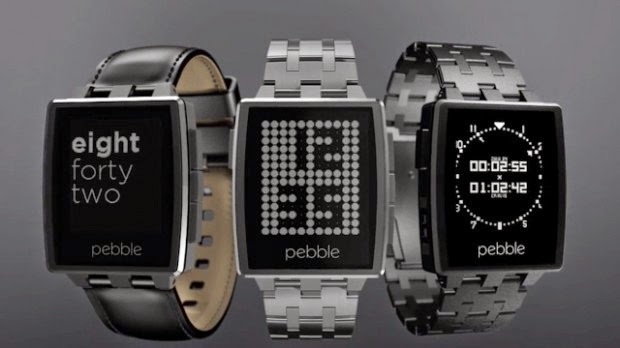 What is even better, one can easily build a watchface - after releasing SDK 2.0, pebbles brings the programming side more in-line with the conventional C++. Writing code for Pebble requires some getting used to but it is not that complicated and the SDK is well documented! Here is a version of the Text Watch I wrote (reusing an existing conversion routine for numbers to text out of sheer laziness), but this watchface displays the time using Cyrillic alphabet in my native Bulgarian Language. 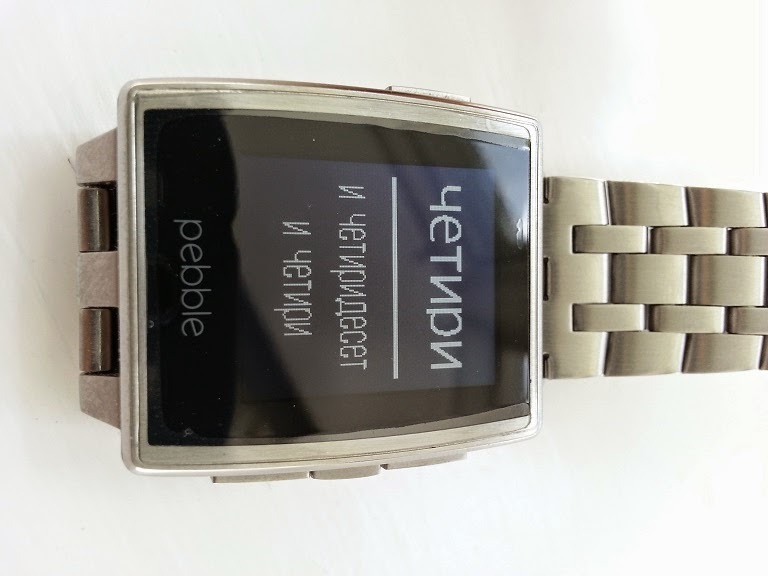 It can be found in the Pebble Appstore as Bul Watch. The words for "eleven" and "twelve" in Bulgarian language are pretty long, so the font size changes to smaller one when the animation will fly in these words and go back to large when any other word is displayed for the hours text. Even if you don't care about the Smart Watch capability and Smart Phone connectivity - Pebble Steel works fantastic as plain old watch and you can load some pretty awesome watchfaces. The major drawback is the need to charge it every 7 days, but the magnetic charging cable makes it very easy. "Major" drawback is when compared to a classic digital watch. It is actually a major advantage compared to other smart watches. No other smart watch on the market has such battery life! I am a guy who works long hours and I need something that will last for days between charges ! I don't want a useless chunk of metal of my wrist by mid-day! So battery life is fantastic for what it does! The display is great too - black and white but perfect under direct sun light!